New York State’s voter turnout in the 2012 presidential election was 47th best in the country. It is difficult to discern the cause of low turnout, but there is no question that changes in election procedures could make voting less difficult and encourage turnout. The manner in which a state conducts and regulates its elections determines whether voting will be easy or hard. Each state determines its election rules, even when electing a President. The United States constitution permits Congress to override the state-driven process by enacting federal laws governing elections, but Congress has done so sparingly, as, for example, in the Voting Rights Act. So how is New York doing in encouraging voting, and what should the State do to improve? Same Day Registration. Currently, a new voter must register no later than 25 days prior to an election, and, because New York State has a closed primary system, a new voter must have enrolled in a party 25 days prior to its primary in order to vote. Although this waiting period may seem reasonable, there are people who focus upon the importance of voting only immediately before an election. Every state but North Dakota requires registration of some form, but, by 2015, there will be ten states that allow voters to register on election day, including California. So-called “same day” registration would increase turnout, perhaps dramatically. Not everyone follows a presidential or local race with equal diligence or focus. 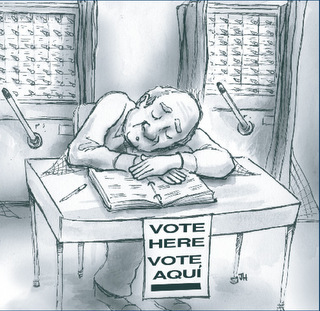 Allowing residents to show up and vote, even at the last minute, is preferable to depriving them of a chance to vote. As long as new voters bring the necessary identification, as any first time voter must do, and they vote on provisional ballots, the board of elections would have sufficient time to scrutinize their bona fides before counting the ballots of same day registrants. There is little risk of fraud. A new voter’s ID would ensure that there is no impersonation-voting. A statewide database of voters, to which each of our county boards has access, would permit cross-checking so there is no duplicative-voting. Although I know of no real fraud in states that permit same day registration (or more than a handful of fraudulent attempts anywhere, for that matter), careful protocols would prevent it. And, of course, the upside is the potential for increased participation and turnout. Allowing Voters to Change Parties. Although same day registration would help new voters, those who wish to change their party enrollment status in order to vote in a different party’s primary election are, and should be, treated differently. The current law discourages a voter who wishes to change parties. New York law requires that the voter must make the change 25 days prior to the general election preceding the new party’s primary. For example, if a Democrat wants to become a Republican and vote in the upcoming Republican mayoral primary in September 2013, the voter would have had to switch enrollments eleven months earlier in October 2012. The same is true for a voter who is unaffiliated and wants to join a party. The law’s rationale, which has been upheld by the Supreme Court, is to protect political parties from party raiding. Raiding is the wholesale movement by members of one party into another for the purpose of taking control of its structure and ballot line, or to nominate a particular candidate. I know of only one such attempt in modern electoral history. This occurred in 2008 by a group of some 1500 Suffolk County residents who en masse joined the Conservative Party for the purpose of electing a particular candidate. It did not work. The Conservative Party, relying on a seldom used provision of the election law, expelled them. Overwhelmingly, party switches occur for idiosyncratic reasons by individual voters. It makes no sense for voters who have switched parties when a hot primary is coming up to learn that they should have done so as much as eleven months earlier. We want people to vote. If a voter feels more attracted to a new party because of domestic or world events, that voter should be permitted to do so expeditiously. So how do we reconcile the party’s right to protect itself from raiding and the voter’s right and desire to associate with a new party? We need to shorten the time for such change in enrollment. Voters should be able to switch enrollment 60 days before a primary. This is enough of a window period to make it difficult for a concerted effort to raid another party, but not long enough to disenfranchise many voters. The Voting Experience. Assuming that we can make it easier to register and change parties, our voting rolls would increase and, it is hoped, so would turnout. New Yorkers already perceive election day as a challenge. Higher turnout would make the voting experience more difficult. We see this during presidential elections, where New York’s ordinarily abysmal turnout rates are spiked resulting in long lines almost everywhere. Everyone agrees, however, that the process could be more efficient. Here are some suggestions. Better Poll Workers. The polls are open in New York City from 6 a.m. until 9 p.m. Poll workers must report at least a half-hour earlier in the morning, and usually do not complete the canvassing process until 10 p.m. at the earliest. They are, moreover, paid only $200 for this very long day. These hard working folks often bear the brunt of voters’ frustrations, but they are doing the best they can. Poll workers are appointed by local political leaders, and, clearly, the system has not worked so well. We need to recruit motivated, better educated poll workers; perhaps a civil service exam ought to be required. In any event, the legislature needs to raise their pay and modernize the training. Otherwise, New Yorkers will understandably grumble every time they go to vote. They deserve better. More Polling Sites. In many instances, too many voters are crammed into a polling site. There are many venues, especially in New York City and other urban areas that serve several election districts, causing an overflow of voters during relatively high-turnout elections. We know, for instance, that during presidential elections, even a school gym is often too small to accommodate so many voters. It is certainly easy enough to require more polling sites during presidential elections. This would decrease the voters’ waiting time. Changes in voting locations present other challenges. Local boards of elections must notify voters in a timely manner. Mailings are important, but placing posters in buildings and throughout the neighborhood can be done as well. We do not want the introduction of more polling sites to cause confusion as to where to vote. Use of the Statewide Database. Every poll site should have computers containing the statewide database of registered voters and enrolled political party members. This would allow all voters to be advised immediately if they are at the correct polling site. If not, a voter can be directed to the right one. Too many voters lose their votes because they are at the wrong site – either because they erred, or were given wrong information by poll workers. Early Voting. Thirty two states and the District of Columbia allow some form of early voting, and so should we. Early voting provides the voter with the opportunity of choosing on which day to vote: some states permit voting for several weeks before an election, some just several days before election day. Voters gamble a bit when voting early because subsequent events might change their mind. But that is their choice. And the benefits are manifold. Early voting reduces the number of voters on Election Day, and thus streamlines the process. It gives voters the opportunity to manage work, childcare and school, and not worry that their daily lives or unexpected events will interfere with casting a ballot. Turnout is increased. No-Excuse Absentee Voting. In addition to early voting, we should change our law to allow voters to cast ballot by mail. Absentee voting by mail is currently allowed only if a person is away from the county, is ill, or has some other statutorily-permitted reason. Many states allow voting by mail in advance of the election without the need to provide any excuse. New Yorkers should be given a wide variety of options to vote. There is no reason to restrict mail-in voting to people who are away or sick. Voters’ real-life obligations sometimes prevent them from making a trip to the polls on a specific day. They should have the option of voting in advance, either in person (early voting) or by mail. Expanding the Voters’ Choice. Current law, though liberalized over the last several decades, still makes it difficult for those who wish to run for office. Candidates for practically all public offices must satisfy residency requirements and circulate nominating petitions to secure a place on the ballot. These rules are in need of further reform. Residency. To run for the New York State legislature, one must live in the district for a year prior to the election. On the other hand, to run for Congress, one can live anywhere in the state. In some cities, one must live within the appropriate district for 30 days to run for its council or mayoralty. In others, New York City, for example, one must live in the district only on the day of the election. This patchwork system, apart from the obvious confusion it engenders, lacks a coherent rationale and, in many instances, is anachronistic. A state senate candidate who recently moved into a district can be just as familiar with the issues of the neighborhood as someone who has lived there for a year. It should be up to the voters to make that decision. That same senate candidate is also required to have lived in the state for five consecutive years prior to the election. Isn’t it wholly possible for someone to move between New York and Washington DC, for example, and still maintain roots and knowledge about the community? And, here, too, shouldn’t the voters decide? We live, after all, in a very mobile society; some are fortunate enough to have multiple residences; and living arrangements between and among family members are varied. One no longer needs to live in a place to know about its issues. Only one eligibility requirement should exist: a candidate should live in the district on the date the candidate takes the oath of office. There is no legitimate rationale to require it before that date. If the voters of a particular district have a problem with a new resident, they are free to vote for another candidate. The elimination of residency requirements would allow more people to run for office, and, more importantly, give voters greater choice. Ballot Access. Although New York has reformed its ballot access requirements, candidates for office are still required to circulate nominating petitions to get on the ballot. The rules, though relaxed over the years, remain hyper-technical. These requirements were put in place to show that candidates have some modicum of support and to make sure the ballot is not cluttered with frivolous candidates. Nevertheless, we should reform ballot access laws to make it easier to run for office. This, too, would give voters more choice when casting a ballot. Voters certainly can discern between the serious and frivolous candidates, and intelligently choose among them. And they should have as broad a choice as possible. Some states permit would-be candidates to pay a modest fee to get on the ballot. New York should allow this as an alternative option. Or, perhaps, if a candidate has raised a certain sum of money from a designated number of voters in a particular district, that, too, could be an avenue to getting on the ballot. Close Elections. Some elections are very close. In January 2013, for instance, a New York State senate race, after months of litigation, was won by 18 votes out of some 126,000 cast. Seventy-seven days after election day, George Amedore conceded to Cece Tkaczyk, but, in the absence of a full recount of all ballots cast, are we certain as to who really won? Unlike many other states, New York (outside of New York City) has no law requiring a hand recount if the margin is thin. Some states require a hand recount if the margin is less than one-half of one percent, as does New York City, which requires an automatic hand count when the margin is .5% or less. New York State lacks such a rule and leaves the candidates to fight in court for months over ballots. A judge could, of course, exercise discretion and order a district-wide hand recount. The better practice would be to have a bright line rule so that discretion by a court is removed. A mandatory hand recount of all ballots in close elections would produce a clearly defined winner – to which the voters are certainly entitled. Fundamental Reform of the Board of Elections. Through most of the twentieth century, the Office of the Attorney General had jurisdiction over campaigns in New York. From 1922 through 1974, the Attorney General possessed sweeping powers to investigate election law offenses. Any findings could then be turned over the appropriate District Attorney; the Governor also had the power to appoint the Attorney General as a special prosecutor. In the wake of the 1972 Watergate scandal, New York created a bipartisan board of elections. For several years, the new board had concurrent jurisdiction with the Attorney General to investigate such violations. However, in 1978, with the consent of Attorney General Louis Lefkowitz (who was relieved to be rid of this political headache), the legislature stripped the Attorney General of this authority, leaving the board with sole authority to investigate. Bipartisanship at the board has sometimes caused gridlock. Lack of resources for the board has often stymied its efforts at conducting investigations. In any event, the result is that the board is viewed as a toothless tiger in the area of enforcement. During the years 2002 through 2012, the board received 1016 complaints. It investigated and issued final determinations on only 31, a mere 3% of all complaints received. It referred a paltry five matters to the District Attorney, only 0.5%. While it is certainly possible that many of the complaints were not substantial or even frivolous, a review of the final determinations issued by the board show that even serious matters were handled with kid gloves. A return of investigatory power to the Attorney General would significantly change the way elections are regulated in New York. The Attorney General has sweeping powers in other areas of malfeasance or criminal conduct; it makes sense, therefore, for the Attorney General to have concurrent jurisdiction with the District Attorneys to prosecute election violations, including fraud or crimes relating to petitioning, campaign finance and voter suppression. In addition to regulatory and enforcement matters, the legislature should take a hard look at whether the bipartisan nature of the State’s sixty-two local boards is the most efficacious way of actually running elections. It may be that a non-partisan, independent regulatory agency, such as the Secretary of State’s office, would be better for registration, for conducting elections, and for managing recounts of hotly contested elections. It might not be a popular alternative for many in the legislature, but it’s the kind of fundamental step that might very well fix our creaky system. It’s certainly worth a look. — Jerry H. Goldfeder practices election and campaign finance law at Stroock & Stroock & Lavan LLP. He teaches Election Law at Fordham Law School and the University of Pennsylvania Law School, and is the author of Goldfeder’s Modern Election Law, now in its Third Edition. –For more articles like this one, we encourage you to subscribe to CityLaw, a 24-page bi-monthly journal, provides an overview of the City’s regulatory developments by reporting on administrative, legislative, and judicial decisions. The publication consists of a featured article, a legislative and regulatory update, case law highlights, and a profile.